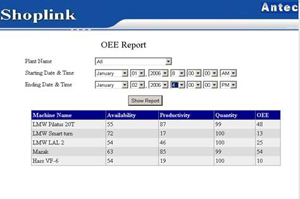 SHOPlink is a combination of Electronic hardware & software for collecting valuable data from factory on line. It can be connected to various CNC machines as well as manually and NC operated machines. It can monitor events & collects some data from operator’s panel. Data from operator panel can be customized. 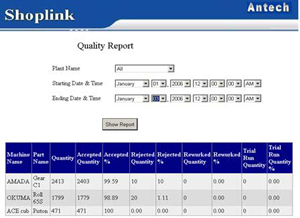 Collected data can be utilized to generate various MIS reports. This reports are useful for Management to calculate overall efficiency of the plant. 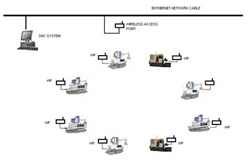 SHOPlink can be integrated with wireless or wired DNC network. 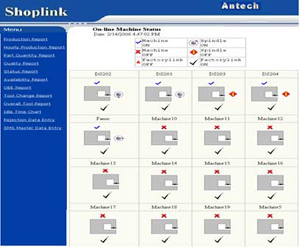 SHOPlink hardware interface units can be connected between PC and NC/CNC for collecting on line data from CNC. 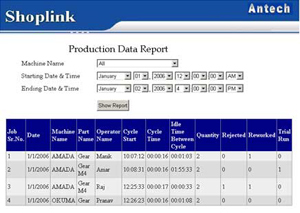 SHOPlink software shows on line status of all NC/CNC machines from Server. It has simplified menus for on line selection of various reports to be generated on line. This shows Machine on/off status, Cycle or spindle on/off and SHOPlink on/off status on line. This can even monitors old NC and manual machine. And can be accessed from anywhere Important parameters of the machines also can be monitored and displayed on line like temperature, vibrations, acoustics etc. What SHOPlink can generate ? 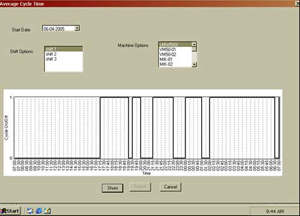 It generates production data from each NC/CNC machines with cycle time and idle time. It also shows whether it is rejected one or reworked or trial one. Average cycle time, idle time is shown in this report so that quality checks can be put and monitored. Operator name is also displayed at each job indicating his credit which can be counted at the end of the day for calculating his productivity which can be rewarded in the form of incentive. This generates quality related reports on line. It shows accepted, rejected and trial run quantity and it’s %. With this you get data from each machine as well as operator to calculate operator efficiency so that incentives based on production can be paid. This can be made available to the customers for finding exact status of produced quantity. This generates machine utilization report in the form of OEE. This OEE can be generated at any point of time; Specify period and OEE is generated for a machine or cell. This is very important report. Management would like to know the OEE and it’s improvement. Even 2% increase in this efficiency would get ROI of SHOPlink system. This graphs can show effectiveness of production time and idle time. Idle time in various areas are displayed in different colors to understand it quickly. This can be used for presenting effective utilization of production time. It can be generated with various combination like single machine, multiple machines, cell, plant, line and with specified period like week, months, quarter and yearly. 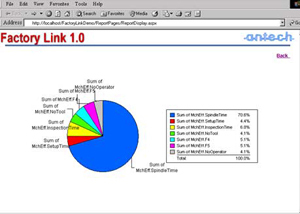 This report shows cycle time and idle time in graphical format. This would be very important to check whether average cycle time is maintained over a period of time to maintain consistent quality and efficient utilization of tooling. This would also show trial run cycle run time. This can be used to analyze job rejection causes.